Whether you manufacture paper, process it or print it, or even print metal, we can improve your processes with the help of air technology. Our filters and fans provide clean air and ensure efficient production. Since the invention of paper in China, paper technology has spread throughout the world. Paper production processes have been immensely improved, and automation has steadily increased. Today’s paper machines must meet the most exacting requirements, which we satisfy with high-quality components for each production stage: from the fibre through the paper reel to the finished, cut sheets. In the production of paper, pulp and cardboard fine dust, fluff, shavings and trimmings are generated which interfere with production and therefore have to be removed. LTG’s filtration systems can separate these fibres and dust particles from the air and pass them on for disposal or recycling. Our LTG fans are perfect for these tasks: as part of a modular system, they comprise a complete solution for conveying air and removing dust. LTG’s engineering services resolve theoretical and practical issues at an early stage by means of CFD simulations and calculations. By filtering the waste air from machinery you can protect downstream assemblies and processes from contamination. You can divert the filtered air for heat recovery or even use it directly, without harming the environment. LTG filter technology not only allows you to maintain constant production conditions and uniform quality, it also improves the working atmosphere for your employees. Protect your machines, employees and the environment. For example, use a TVM pre-filter and downstream fine filters like the CompactDrum Filter® to create a clean and safe atmosphere in your production facility. Our fans come in a wide range of flow configurations: LTG axial-flow, LTG centrifugal and LTG tangential. You'll find the right solution for every area of application. LTG radial fans efficiently remove trim strips when paper and cardboard are cut to size. Our conveying fans in the VSR-M/VSR-5 RU..MS series, which are available with optional paper tearers, are specially designed for the extraction of trim strips. The strips are sucked in, shredded and passed on for disposal. For printing of paper and metal we also offer tangential fans. They ensure a constant temperature and air flow over the entire surface of the paper or metal sheet. The drying results are of consistent quality, which helps to speed up production. LTG tangential fans can also be used for drying paint on the outside or inside of tubes, cans or drums. They meet all the requirements for efficient drying. Special high-temperature versions can even handle drying temperatures of up to 800 °C. Our engineers can assist you with their wide-ranging expertise, experience with printing and paper, and many essential tools of the trade. 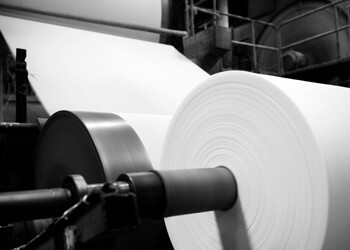 We have a long list of references from the printing and paper processing industries. You'll find a wide range of solutions for paper manufacturers, paper processors and manufacturers of machines for printing paper and metal. Put your trust in our many decades of experience; we implemented our first solutions for the printing and paper industry back in the 1920s.